This post goes out to Alexandra at Stilisti in Boston, who cut my hair for the last few years, and to whom I promised I'd watch the hair trends in Asia! Here's one, especially Taiwan: wavy hair for women, even perms! Also, I like that this girl is holding either wasabi peas or edamame to her face. A classy touch, always. The first thing my mother said when she saw my new haircut was, “You must be feeling pretty comfortable in Taiwan, if you chopped off that much of your hair!” I suppose she was right. Also, I conducted the entire exchange with my stylist in Chinese, just about. So I got what I deserved. Just kidding– I’m thrilled with my new cut– pics below. But seriously, it’s an interesting experience to turn yourself and your appearance, in the form of that wispy stuff framing one’s face, over to a complete stranger in a new language. Due to nerves and procrastination, my friend Nina came with me and reminded me that I didn’t love my hair long, I was just chickening out for a few weeks. And Taiwanese cuts are pretty fun! The trends these days tend to involve layers, bangs (some people here call it a “fringe?”), shorter rather than longer, and of course, perms. Ironic, isn’t it, that in a country of primarily straight hair which most Americans would kill for, people are dying to go curly? Spoiler alert: we did NOT get perms. Maybe next time. So, the details: a picture, as usual, is worth a thousand words. Nina had a very clear idea of what she wanted– a long bob that almost skimmed the shoulders and wasn’t too short in front. My friend Erin, a fellow Fulbrighter in Tou Fen, had gone so far as to print out a sheet of instructions in Chinese for her stylist, including a picture of her old hairstyle the way she liked it, and the phrase, “I do not want bangs!” Even though she has longish layers at the front of her hair, that some people, including her stylist, called bangs. Ahhh, the festive fun of cultural exchanges! I, unlike my friends, had no particular preconceived ideas for this haircut. 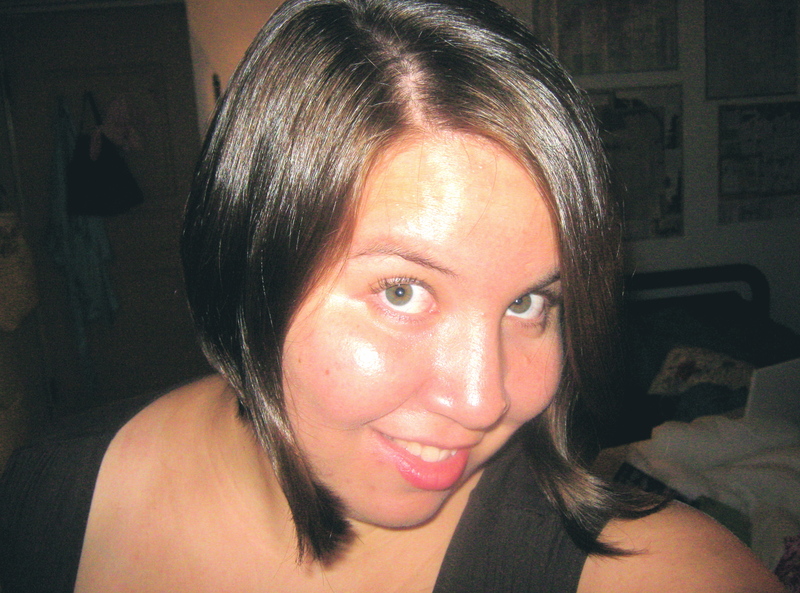 Mainly I just needed it shorter and thinned out, since my hair gets very thick and moppish when grown out too long. I was flirting with the idea of long bangs, which my Chinese teacher taught me are called, “Chang Liu hai” (長劉海). But I also wasn’t sure whether to go with a short bob, or a longer “medium length cut,” which looked great in the hairstyle magazines that the stylists showed me, but also required either permed waves or exact styling of the different layers to not look messy. Basically, I wanted a cut that people around me in Taiwan would read as “haircut” (剪頭髮) and not “train wreck” (災難). So I told my stylist, a lovely, friendly girl who goes by the nickname “Mica,” that although I liked both pictures, I trusted her to use her judgment and do what she thought looked best. Straight hair, right after the cut. 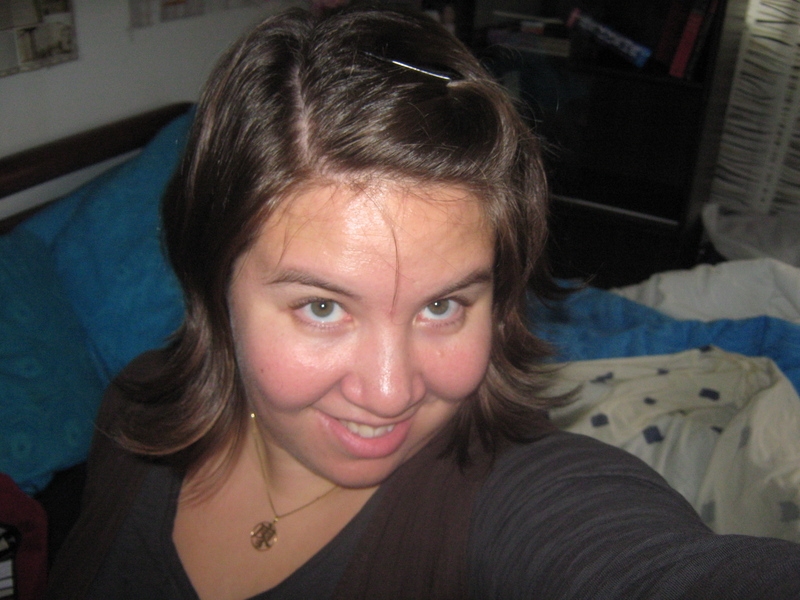 Wavy hair, a few weeks later, bangs pinned up. Beautiful haircut! I also heard that Eddie at Mix & Match gives excellent haircut in Taipei too for foreigners.